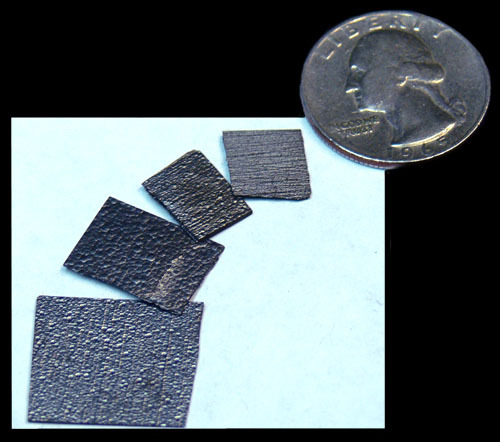 Pyrolytic Graphite exhibits the greatest diamagnetism of any room temperature diamagnetic material. These samples will actually levitate over Neodymium Magnets! 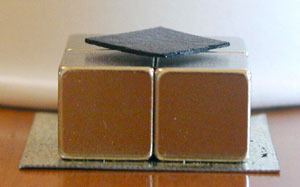 Shown here floating over four 1/2 inch cube magnets. Pyrolytic graphite is made by heating methane gas at low pressure to 2000 degrees Celsius. Very slowly, a layer of graphite grows. The layers of carbon atoms form like a crystal of hexagonal sheets. These sheets lie on top of one another like sheets of mica. They are separated into thin slices with a sharp knife or razor blade. The thinner the slices are, the higher the Pyrolytic Graphite will levitate. The magnets must be arranged as shown here for the PG to levitate. Using a razor blade, cut the PG sample so it is smaller than a single magnet (under 1/2" square if using 1/2" cube magnets). Make sure to always cut your Graphite square smaller than the size of a single cube or it will be unstable when floating. An easy an inexpensive way to demonstrate magnetic levitation and diamagnetism. Several slices of various sizes of Pyrolytic Graphite are included.